I have no problem with playing a 4-3-3 style of football, but one needs to seriously assess whether they have the personnel to play that way. Valverde started with Ter Stegan, Semedo, Pique, Lenglet, and Alba in defense. The midfield trio of Rakitic, Vidal, and Busquets occupied the midfield. In attack, we had Dembele on the right, Coutinho on the left and Messi in the center. Messi's situation is quite strange, he himself was playing as a false-9 but with a midfield which has Vidal and Rakitic, what is the use in playing him as false-9 is still a big question? He has to drop into midfield to organize some attacks and in such a scenario, the central defenders are not going to follow him into the midfield. The midfield of Rakitic, Vidal, and Busquets never had the skill set to control the midfield, something which is essential to deploying a 4-3-3 formation at Barca. Regardless of that Barcelona dominated the ball from the word go, and that's majorly due to the lack of ambition shown by Villareal in the opening exchange. Dembele who started on the right was the best Barca player on the pitch. He along with Semedo was creating most of the attacks but the end results were lacking. Lionel Messi struggled to get involved in the attack as the majority of attack was bypassing him. Still, he was the first one to create a real danger when he forced a save with a curler from outside the box. Soon we were reminded about the fragile nature of our defense when a non-dangerous situation turned to be extremely dangerous when the communication between Lenglet and Ter Stegan broke down. We were lucky that Moreno's effort hit the post rather than going in. Barcelona kept on dominating, but the end result was not coming courtesy of some excellent defending and some wayward passing. Then in the 36th minute, Barcelona took the lead through Pique, who headed home from a Dembele cross from a corner situation. He showed remarkable spirit to climb over the defense to gain the advantage. After that thing just fizzled out with no team making serious effort to impose their game. As in our other matches in this season, the second half followed the familiar pattern. We started as the better team but couldn't make anything in the initial exchange. After that Villareal was the better team throughout the half. Every one of our attacks ended with either a miss pass or some careless play. The more the game dragged at 1-0 scoreline, the more tensed the fans became. Barcelona was in need of some fresh legs to impose their will on the game. The first substitute was made in the 70th minute with Alena replacing Vidal. Everyone was seriously shocked as the expected replacement was for Coutinho, who had yet another bad game. In the 80th minute Malcom was brought in to infuse some pace into the proceeding. That should have been a substitution some 15 minutes earlier. 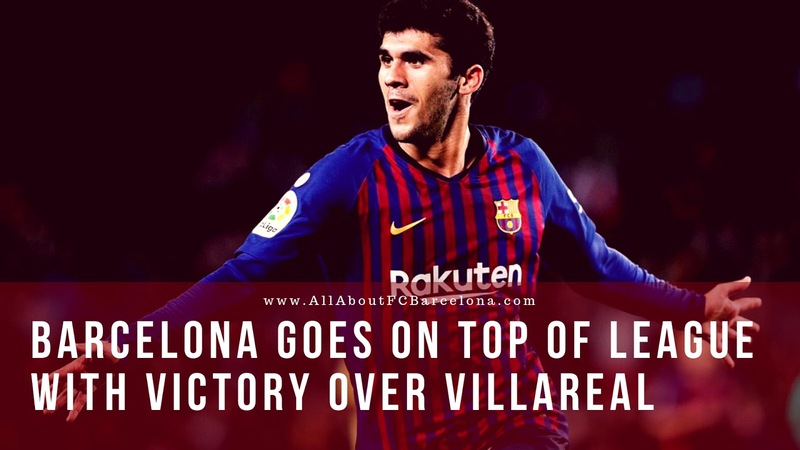 Anyways Messi eased our nerves when he sent in a delightful through ball putting Alena through on goal and the youngster showed enormous composure to lift the ball over the onrushing keeper to score his first La Liga goal at the Camp Nou. Let's hope it's just the start of something big. Are you looking for the best FC Barcelona v Tottenham Hotspur tickets? Click here and book your Champions league tickets securely online. Once again, it was a performance which convinced none but got us the vital three points. Dembele was brilliant on the right, but the biggest problem will be how to use him once Saurez returns to the side. Messi looked lost in the false-9 role. We could only tell once Arthur returns whether he can still shine in that false-9 role. Without any doubt, this was a victory which raised more questions than answers!